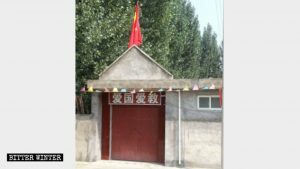 The CCP is successfully keeping up its efforts of turning houses of worship into government-sanctioned activity centers, for everything except religion. 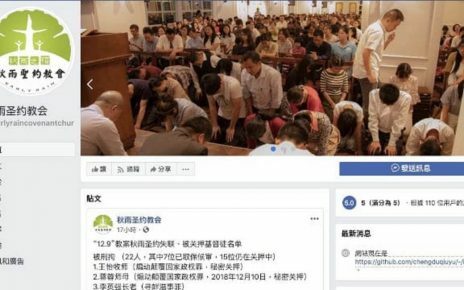 The story of the mass campaign in Central China’s Henan province to convert churches from places of worship into government entities seems like an old one, except that it’s continually happening, almost daily, and worse, it’s spreading to other provinces. Yongtai Church was turned into a water supply station. 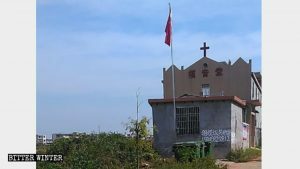 The Chinese characters reading “love the country, love the religion” were put up in Yongtai Church before it was forcibly occupied. 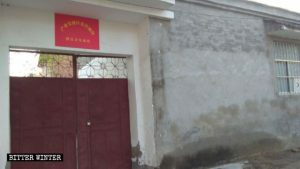 In October, the Maoling Church congregation venue (a house church meeting venue) in Jiyuan city’s Potou town was cleared out and converted into a “Wedding and Funeral Council.” The same month, a sign reading “Zhangjin Village Cultural Activity Center” was posted on the entrance to the Three-Self Church of Zhangjin village in Jiyuan city. 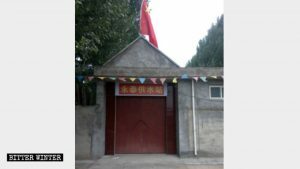 A sign reading “Cultural Activity Center” has been put up at the entrance to the Three-Self church of Zhangjin village. The Three-Self church of Zhangjin village was cleared out and converted into a cultural activity center. A sign reading “Zhangjin Village Cultural Activity Center” on the wall of the Three-Self church of Zhangjin village. Original appearance of the Three-Self church in Huacunpu village. 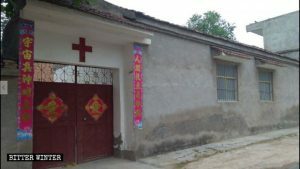 The Three-Self church in Huacunpu village was converted into an activity center. And Bitter Winter continues to receive news like this, but lately with the added worrisome news that other provinces are beginning to experience the same hijacking of their religious sites. A Three-Self church in Shangrao city was turned into an activity venue, its cross taken down and placed on the balcony. A Three-Self church in Shangrao city before being repurposed. 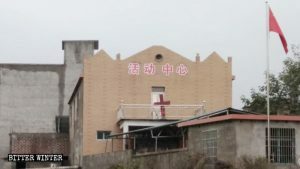 On November 1, government personnel from Jiangxi’s Heshang town in Chongren county, under the jurisdiction of Fuzhou city, arrived at the Catholic Church in Xiabei village and demanded to take measurements of the church, seeking to convert it into a senior recreation center, but this was opposed by the believers. Three days later, local government personnel drove vehicles loaded with all kinds of equipment for the senior recreation center and attempted to occupy the church, but were unsuccessful since they didn’t have the keys. It is understood that the construction of this church was funded by members of the Underground Catholic Church, and it was forcibly closed in March 2014. 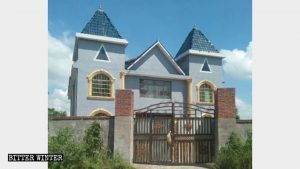 Subsequently, nearby believers secretly held religious activities inside the church several times but were discovered by the police each time. 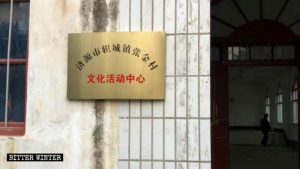 In August 2018, the local Religious Affairs Bureau demanded that a priest from the Chinese Patriotic Catholic Association be assigned to move into the church, but this was met with strong opposition from the believers. Now, church members are worried that the church will be forcibly expropriated by the government. The Catholic church in Chongren county, which is about to be converted into a senior recreation center. 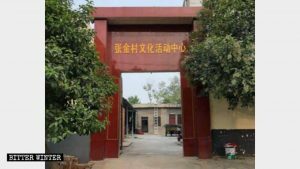 In September, a house church meeting venue in Tongjiang city, in Heilongjiang, China’s northernmost province, which was purchased with funds raised by the believers, was converted into a senior activity center, leaving more than 300 believers without a place to congregate. 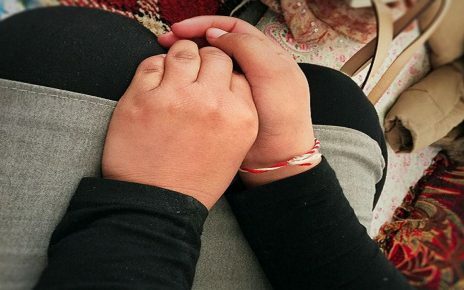 This happened despite the fact that the church’s pastor had repeatedly applied for interim approval as a religious activity center, but government officials never approved the request. And then, in March 2018, the National Security Brigade descended on the venue and demanded that the pastor stop all preaching in order to comply with an inspection for fire-prevention. 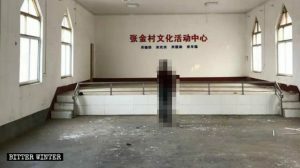 The pastor, who, according to believers, has always refused to join the Three-Self Church, was taken away by the authorities. Now, the believers still technically retain ownership of the meeting venue but they’re prohibited from holding religious services there.